How the New 2017 DIM Shipping Prices Will Affect Your Bottom Line? Navigating the world of the garment industry is a lot of work on its own. From manufacturing to finally getting your product on the shelves, it requires a great amount of knowledge and a whole lot of research to get it right. Just a couple years back, the major parcel services implemented their new DIM pricing models, completely changing how companies would pay to ship their goods. You probably remember researching just what this meant and how it was going to affect your bottom line. Many companies also spent time playing around with the new system - which measures cubic volume instead of weight - to see if there was any way they could ship their product more cheaply by changing up the way it’s packaged. Now, the parcel services are changing their rates again. This means that you’re going to have to re-evaluate the current DIM pricing models and how it will affect your business. Here, we’ve broken down everything you need to know so you can keep your business running smoothly. With this new pricing system, a package’s dimensional weight is calculated by multiplying a package’s length, height, and width, then dividing it by the parcel company's DIM factor. Why do the parcel companies want to implement DIM pricing? In the end, it is about the precious space available on their transport trucks and vans, alongside making a profit. With eCommerce booming, the parcel companies have grown right alongside it. During that time, they’ve realized that the “real estate” on board their trucks and vans are more valuable than ever, so why not charge for it? That’s when DIM comes into play. Instead of charging for how much a package weighs, they’re charging for how much space it takes up. A common misconception is that DIM pricing doesn’t affect small and light products. That is true, but only to a certain extent. For example, let’s say you’re shipping very thin cotton t-shirts in a 12” x 12” x 12” box. Between the shirts, box, and tissue paper as filler, the total actual weight of the parcel is 5 pounds. Another important thing to understand about DIM pricing is that they will always use the heavier weight to base pricing off of. For example, say you’re shipping 20 pounds worth of jeans. The jeans fold up into relatively small squares, fitting into a nice 12” x 12” x 14” box. In this case, the DIM weight will actually be lighter than the actual weight of the package when you do the math. Because the actual weight is more than the DIM weight, the parcel company will automatically choose to charge you for that instead. Dimensional weight has been in use since 2015, and in that time, the parcel companies have realized that they can make more money off of it. Therefore, any old calculations or websites you used to help determine the price of your package are now obsolete. Luckily, our friends at Red Stag Fulfillment understand the frustration of so many in the eCommerce industry and have decided to help. On their website, you can find an easy-to-use DIM weight pricing calculator that will help you determine the new shipping prices at FedEx and UPS. This tool is an awesome resource because it’s accurate, and it lets you easily play around with the numbers. Now you can accurately figure out shipping costs, and also experiment with different dimensions and weights to figure out the best solution for you, your business, and your bottom line. But first, let us explain what changes are actually being implemented at both FedEx and UPS in terms of DIM pricing. FedEx has upped its DIM factor from 166 to 139, but don’t let that fool you. This means that DIM weights are actually going to be heavier than before. 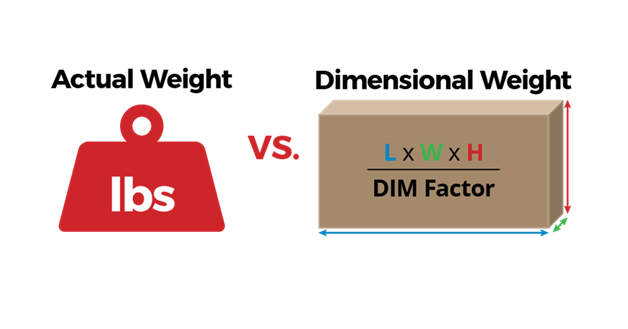 For example, in 2016, if you shipped a 10” x 10” x 10” package that weighed 5 pounds, your old DIM weight calculation would be: (10 x 10 x 10)/166 = 7 pounds of dimensional weight. Thus, you would be charged for shipping a 7-pound package, since the DIM weight is greater than the actual weight of your package. With the new DIM factor at FedEx, the dimensional weight of that same package is now 8 pounds: (10 x 10 x 10)/139 = 8 pounds. And in this case, your FedEx shipping charges would be based on the DIM weight of 8 pounds, since it’s greater than the actual weight. FedEx has also adjusted its base billing rates, giving UPS a small price advantage in Zones 2 through 4. Then there’s UPS, which has kept its DIM factor the same at 166, but only for packages under 1,728 cubic inches, which is the standard 12” x 12” x 12” box. Any parcels bigger than that will use a DIM factor of 139, ultimately upping the price. 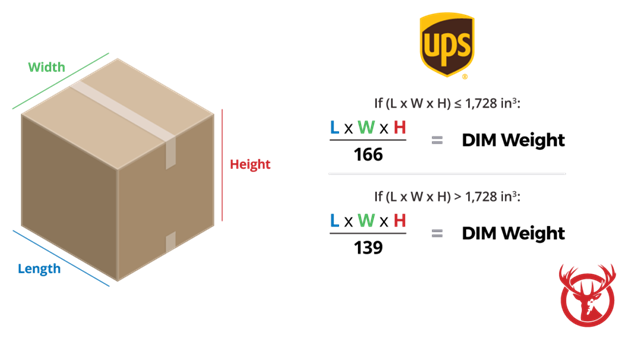 For example, if you shipped a 10” x 10” x 10” package with 6 pounds worth of shirts, your UPS DIM weight calculation would be (10 x 10 x 10)/166 = 7 pounds dimensional weight. You would be charged for shipping a 7-pound package since the DIM weight is the same as the actual weight. This is the same shipping charge as last year. And take note, for this package, UPS has a DIM weight one pound less than FedEx. On the other hand, if you ship the same amount of shirts weighing 6 pounds, but packaged it in a less-than-optimal 12″ x 12″ x 14″ box, you would see the UPS DIM factor drop to 139, causing the billed weight to increase to 15! Eg: (12 x 12 x 14)/139 = 15 pounds. UPS has also changed its base billing rates, in turn giving FedEx a small advantage over them in zones 5 through 8. So, how do you make DIM pricing work for your business? E-Commerce isn’t slowing down anytime soon, and that’s great for your business. But, it’s also great for the parcel service, and it wants its fair share, too. As we see DIM prices increase, it’s as important as ever to stay on top of the updates to the DIM factor, use the right tools to calculate costs, and educate yourself on the formulas so you can make the best decision for your business. Reduce parcel size whenever possible. This is not an option for everyone, but, by re-evaluating your box sizes and packing methods, it may help you fit more products in smaller boxes. See what you can fit where, and play around with the DIM calculator to see how it affects your costs. Tip: Always be sure to remember your lessons from high school algebra! The larger the denominator the smaller the solution is. That means you should negotiate the DIM factor as close as you can to 166, the original DIM factor that was implemented back in 2015. Partner with a third-party logistics provider and save a strong fulfillment partner has the leverage to negotiate a much better DIM factor than any small or medium-sized company could probably do on their own. In fact, the right 3PL (as we call them in the industry) can eliminate the new effects that DIM pricing is having on your business altogether. Did you learn something new about DIM pricing? Know someone who would enjoy this article and use the helpful DIM pricing tool? Be sure to share it with them! This article is contributed by Jake Rheude. Online Clothing Study: How the New 2017 DIM Shipping Prices Will Affect Your Bottom Line? The formula for calculating DIM or volumetric weight of a shipment or a package. The new changes in the DIM factor are explained in this article.